← What Is It About The Day Before…. The days have been dreary even if they are warming up a bit now. This is the time of year when I really appreciate a little color in the house now that any holiday decorations are down and packed. It’s the time when the plants I brought in from the garden are beginning to bloom. 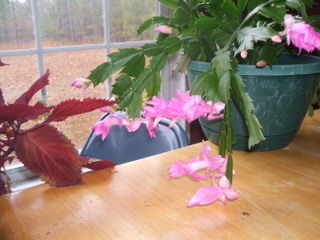 Except for some reason half of my Christmas Cactus bloomed at Thanksgiving and the other half is brilliantly pink now. I’ve been looking for two pillars or boxes just the right height to hold the extra bookshelf slats I had in the shed. Unable to find them, so I put two folding chairs on temporary duty. After all it is the color in the flowers and the fresh herbs that are the stars of the show. The thyme and rosemary also stay healthy and green inside then go back into the garden again. It’s delightful to have herbs to snip at my fingertips without going into the outside cold. 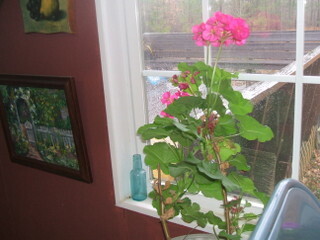 The other flowers are geraniums in hot pink and pale pink which travel back later to the garden. 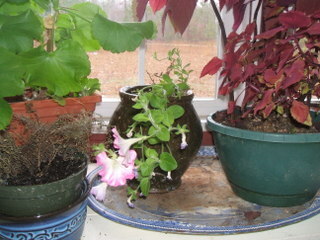 For the first time I brought my pink petunia inside. It has been blooming like it found a home and loves it.